Maskbook finally made its way to one of the most polluted countries in the world just before 2017 came to an end. The workshops could not have come at a better time, given the catastrophic levels of air pollution in the nation’s capital city last November. Throughout the course of two weeks, from December 15th to December 28th, Maskbook traveled from Bengaluru to New Delhi and back again, in a series of workshops organized in collaboration with major players of art, environment and entrepreneurship: Jaaga, Swechha, and Jagriti Yatra. Erica and Aditi before the Pagdandi school workshop began, December 19th, 2017. The Indian School workshop, December 21st, 2017. 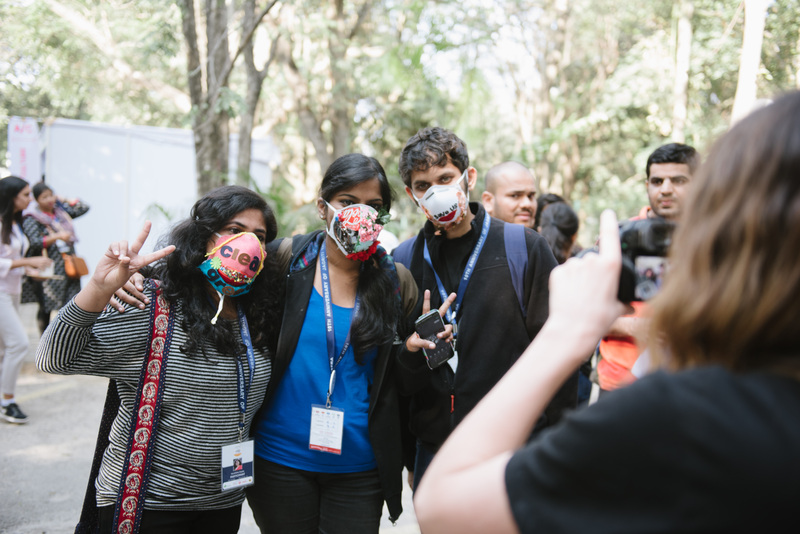 Creative participants of Jagriti Yatra with their masks, December 28th, 2017. The adventure started in Bengaluru, December 15th-17th with two mask-creation workshops and a video-projection of the most striking Maskbook portraits at Bengaluru Fantastic. Organized by Jaaga, the 3-day, tech-arts festival offered a diverse cultural program in which each artwork and event was aligned with a UN Sustainable Development Goal (SDG). The following week, Maskbook joined Swechha, an organization dedicated to enabling change-makers and enacting change for a sustainable society, via environmental education and entreprise. The first two back-to-back workshops took place on December 19th with the boys and the girls of Pagdandi, Swechha’s informal school that aims to teach environmental responsibility and engaged citizenship to the children of Jagdamba Camp, a slum community in Sheikh Sarai, South Delhi. 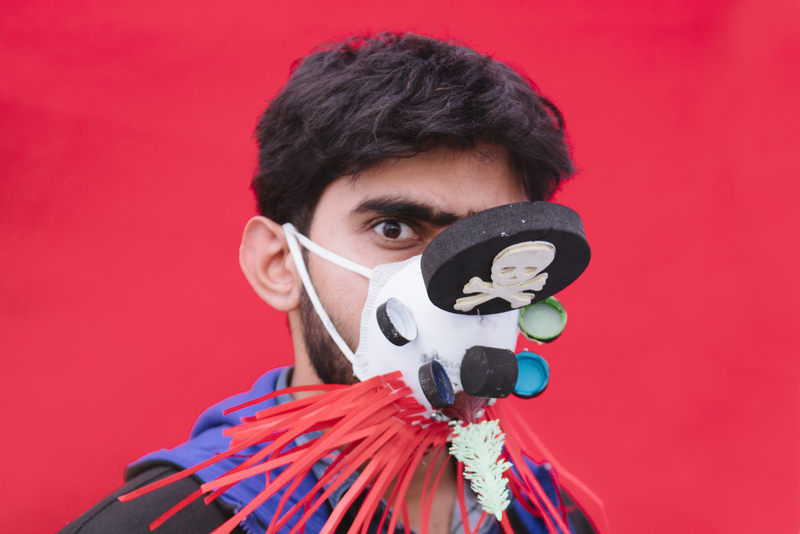 On Swechha’s rooftop terrace, filled with upcycled furniture, vegetable garden and aquapony, the bright youth of Pagdandi vibrantly and enthusiastically created mask upon mask, expressing themselves and voicing their knowledge and experience of air pollution. Shailendra with his mask "Two Differences." 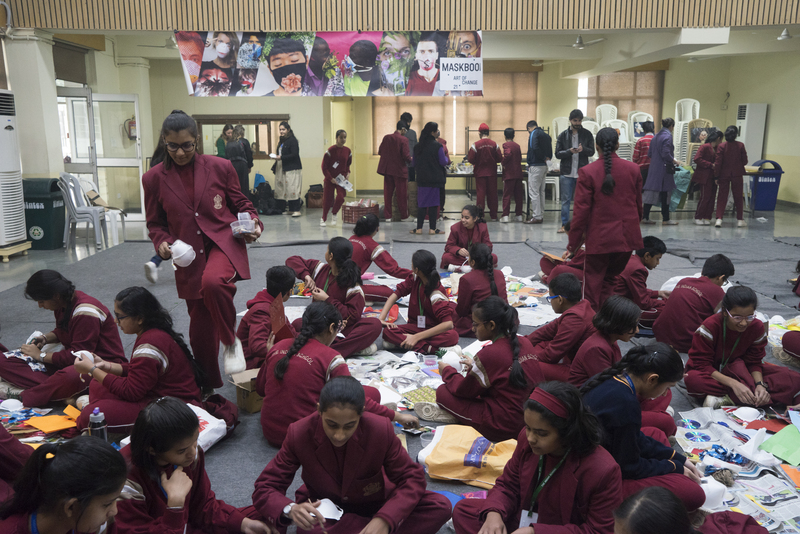 Two days later, on December 21st, Maskbook joined, with the support of Swechha, the Indian School and Foundation School for two more back-to-back workshops, with over 100 students. The two schools, sharing a campus, both boast some impressive environmental awareness and action programs. The Foundation school principal Suzanne Thomas, an Al Gore Climate Reality Leader alum, pointed out air purifying plants and recounted some air pollution « experiments » the children had participated. Rukmini Thampi, Social Science teacher at the Indian School, leads the eco-club, where raising awareness on the environment is a given, but children also act directly for the environment via gardening in the school’s urban farm, through rainwater harvesting, and planting saplings. Here the middle-school and elementary school students crafted some seriously impressive and inventive masks, which could certainly be attributed to their own lived experience of air pollution. When the Maskbook team introduced the project on air pollution, all of the children confirmed they had had their own anti-pollution mask at home and were currently experiencing coughs and colds. Aditya and his mask "The Mirror." The four workshops were an amazing opportunity for schoolchildren to voice their concerns on air pollution and the Maskbook team attested to the powerful masks created as a result. Finally, Maskbook ended the workshop program on December 28th with the biggest workshop to date, a workshop with the 500+ participants of the Jagriti Yatra. Jagriti Yatra is a 15 day train journey that brings together youth from across India who are selected for their change-making ambitions and potential. During the journey across the country, youth meet role model social and business entrepreneurs who are developing unique solutions to India’s developmental challenges. After the Maskbook India team presented the project participants and participating individuals and organizations in the J.N. Tata Auditorium, a huge workshop followed outside, in the serene campus of the Indian Institute of Science. Yet, the workshop was far from serene! Throughout the afternoon and until their buses left for their departing train, the budding entrepreneurs brought their energy, knowledge and change-making tenacity to the mask creation workshop. Lovely Nivetha and "Three R Green World." The Maskbook in India program counted over 1,000 participants from across the country, spanning diverse backgrounds, ages and publics, across two emblematic cities. See our Facebook album of Maskbook in India here. Check out our Maskbook in India video on Youtube. Discover the articles on Maskbook in the Indian press, in Your Story, the Deccan Chronicle, The New Indian Express, and The Hindu! Interested in collaborating with Maskbook ? Contact us! Maskbook in India counted as its patron, Afroz Shah, UN Environment Champion of the Earth. Maskbook counts as its main partner the Schneider Electric Foundation. Maskbook is also supported by UN Environment.